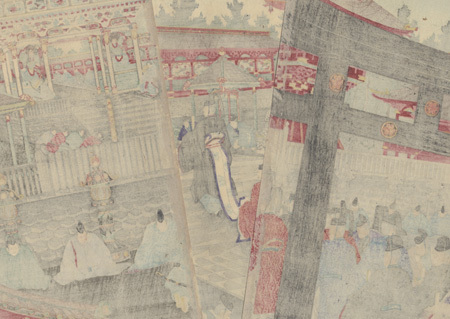 The Household of the Shogun Visiting the Shrine at Nikko, 1889 - Beautiful triptych depicting the shogun's procession paying a visit to Toshogu Shrine at Nikko, the site dedicated to Tokugawa Ieyasu, the founder of the Tokugawa Shogunate. 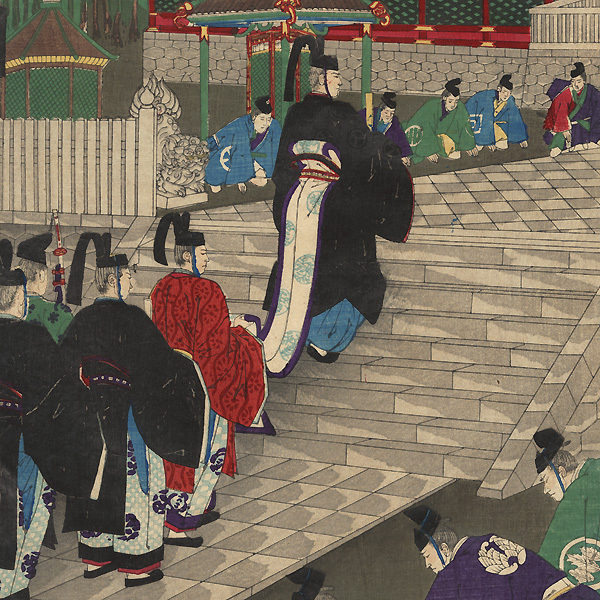 Dressed in formal court robes and caps, the noblemen walk quietly under the black torii gate and up the steps to the entrance gate. Retainers kneel respectfully on either side of the stone pathway. Lovely architectural detail in the colorful and ornate buildings, which feature carved panels and tile roofs. Pine trees rise above the rooftops in the distance under the softly shaded sky. A fantastic design, elegantly printed with rich color and burnishing on the torii gate, and a delicate burnished pattern on the black kimono. The Boston Museum of Fine Arts has this image in its collection. A terrific image. Condition - This print with excellent color and detail as shown. Three separate panels. Small tear, a few small holes, repaired. Slight toning and soiling, a few small marks. Please see photos for details. Good overall.